Our last stop of this trip was the Saxon city of Leipzig. 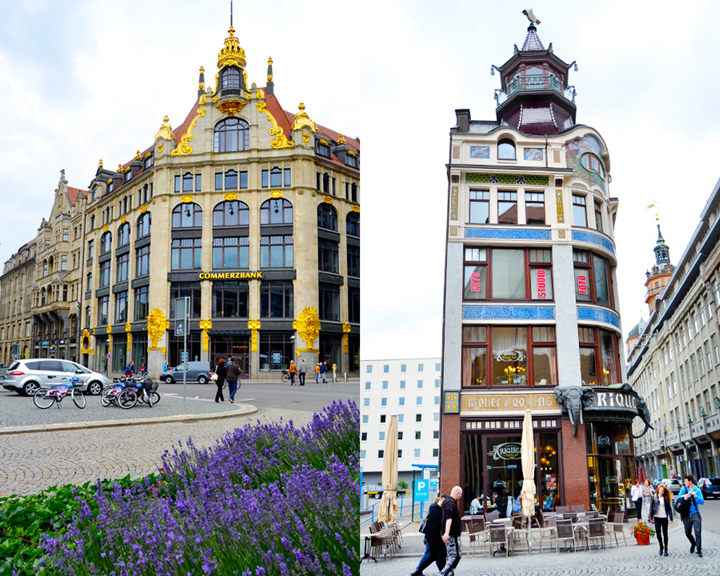 Leipzig has always been a capital of business and of culture. It's also a city of great history - Martin Luther, Johann Wolfgang von Goethe, Johann Sebastian Bach, Felix Mendelssohn, Richard Wagner, Angela Merkel, and many other German VIPs have spent time here. It also some intruiging East German (DDR) sights. Leipzig's venerable university and great cultural institutions - such as the storied Gewandhaus Orchestra and the St. Thomas' Boys Choir - are still going strong today. We drove right into the heart of town and began our tour of the city at the Old Town Hall. The Renaissance style building overlooks the bustling (not today though because of the frigid summer weather) Market Square. Strolling down Grimmaischestrasse. Leipzig once had the higgledy-piggledy cobbles-and-red-rooftop charm of many other German cities. But in the late 19th century, prosperous city leaders decided to modernize and tore down the quaint medieval townscape and replaced it with big, modern buildings. One feature of the "new" (if 1800s is new...) Leipzig that continues today is shopping galleries that burrow through the middle of many buildings. Some of these galleries and passages are non-descript, but many are beautiful. We found the Mädler Passage near the Market Square. Ducking inside we found a lovely shopping area with stores and cafes. The famous German writer Goethe set a scene of his masterpiece Faust in the Auerbachs Keller restaurant located just inside the passage. Statues re-enact the moment when the brilliant scholar Faust (on the right) makes a deal with Mephistopheles to experience as much as possible in the world, but if anything so impresses Faust that he refuses to move on, the devil gets his soul. Heavy. Some of the highlights in Leipzig are the sites associated with the one and only Bach. Just such a place is St. Thomas Church. At this historic church, Bach conducted the boys' choir - the most famous one in Germany - from 1723 to 1750. While here, Bach was incredibly prolific. For a time he even composed a new cantata every week! In front of the altar is Bach's final resting place. Or, at least they think this is him. He wasn't very popular in his own time so when he died he was buried in a humble graveyard. But, after he was rediscovered in the 19th century, aficionados tracked down what they thought were his remains and placed them here. Inside, the clean, white, stripped-down Neo-Gothic interior evokes the Protestant aesthetic of uncluttering the congregation's communion with God. On Pentecost in 1539 Martin Luther came here to perform Leipzig's first Protestant service. Out front stands a wonderful statue of Bach. He's holding a rolled up piece of sheet-music which he used as a baton. His jacket pocket is turned out because Bach was famously always scrounging for more money, not because he was greedy, but because he had a huge family to feed, including his own brood and the boys in the choir he directed to whom he was very devoted. He was a tireless advocated for the arts and did his best to help fund local musicians. Back behind the Old Town Hall is the ornately decorated Baroque Old Exchange building which is now used as a meeting hall. The statues in the top corners symbolize important facets of Leipzig life: Apollo on the left for art and Mercury on the right for trade and commerce. Standing in front of the Old Exchange is a statue of Goethe who studied law here before dropping out to become a writer. It worked out well for him. He's basically to German what Shakespeare is to English or Tolstoy to Russian. The St. Nicholas Church, which was closed for a concert, is Leipzig's oldest. It also played a pivotal role in more recent German history as the home to weekly prayer meetings in the 1980s where residents would meet together to discuss their grievances with the communist regime. Then the church became a major staging ground for protests during the Peaceful Revolution. Out on Augustplatz are some examples of the depressing Communist aesthetic. The Opera House is actually fairly pretty for an Eastern Bloc building. Also on the square is Leipzig's first skyscraper, teehee. Ubran life with the old Post Office in the background. The MDR Building, on the left, was erected in the 1970s as part of Leipzig University but is now privately owned, while the glassy structures on the right remain part of the school. The pointed facade marks "St. Paul's" where a 13th century church once stood but was demolished by the communists in 1968. To pay homage to the sites former purpose, the new building resembles a church but is still part of the university and is used for both religious and secular gatherings. Just off the square is a sculpture entitled, Untimely Contempories, a pun in German, with exaggerated caricatures of hypocritical DDR figures. For example, the teacher holds a mallet used to pound communist ideology into her students. There are some fascinating museums in Leipzig about the DDR and the like, but we've tried places like that with kids before and it doesn't work out too well. So, we decided to just stroll and explore and of course stop for ice cream. Not even the freezing temps (okay, it was probably still about 50 degrees) could persuade the kids to turn down eis. The Evans Family in Leipzig, Germany on Sunday June 21st 2015. Oh, how cool you came to Leipzig. We could have met for a coffee or a private sight-seeing tour (I'm living in Leipzig). Well, maybe next time ;). It was a fun stop! LOVING the photos!! Love all the statues, especially Bach's! !